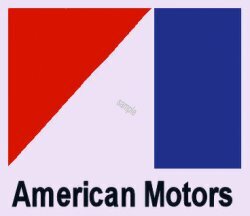 American Motors insignia from the 1970s - $10.00 : Bob Hoyts Classic Inspection Stickers, Add a Final Touch to your Restoration! was issued to usher in the NEW American Motors around the time of the Javlin and AMX cars were issued as a last ditch attempt to compete with the BIG THREE. We have carefully restored and reproduced it with our patented "Peel and Stick" format that allows buyer to place it inside your classsic car window.. It is appoximately 2 1/2 inches square.